The Accused in front of Fallout! 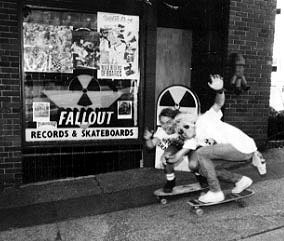 On this site you can read more about Fallout or flip through some of the pictures in the photo gallery to see some of the many bands and artists that have stopped by Fallout over the past 19 years. The latest additions are pictures of our last-ever in-store show with American Death Ray, and shots of Deadly Weapons, and The Wild Hairs! We aren't currently updating the gallery but we do have quite a stash of interesting photos and other relics from the past which may make it up there some day ... until then there's plenty of in-store photos to keep you busy. And if you're itching to get your hands on a Fallout t-shirt, get 'em here! Fallout Records can be contacted by e-mail at info (at) falloutrecords (dot-com).